This media chest features a broad, flat top for displaying your flatscreen TV and easy-to-access compartments for storing your DVD, Blu Ray, or video game playing devices. The storage compartments are either open in front or feature drop-front drawers and pull-out shelves for the quickest possible access to your media players. Wire management openings are built into the backs of all media storage pieces for convenient wire wrangling and simple device set-up. Inspired by European styling, this ornamental media chest has wonderful vintage style and plenty of storage space. Three drawers and a door provide convenient storage space for media consoles and all the accompanying accessories. The chest has charming traditional details such as bun feet, rounded corners, crown molding, and raised drawer panels. The door has glass panels accented with serpentine accent patterns. A hidden top drawer is lined with felt to help protect delicate and valuable items. The Bellamy Traditional Media Chest by Magnussen Home at Miskelly Furniture in the Jackson, Pearl, Madison, Ridgeland, Flowood Mississippi area. Product availability may vary. Contact us for the most current availability on this product. 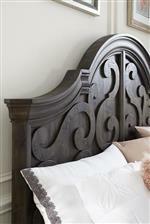 This regal collection draws inspiration from European styling with ornamental, elegant designs. 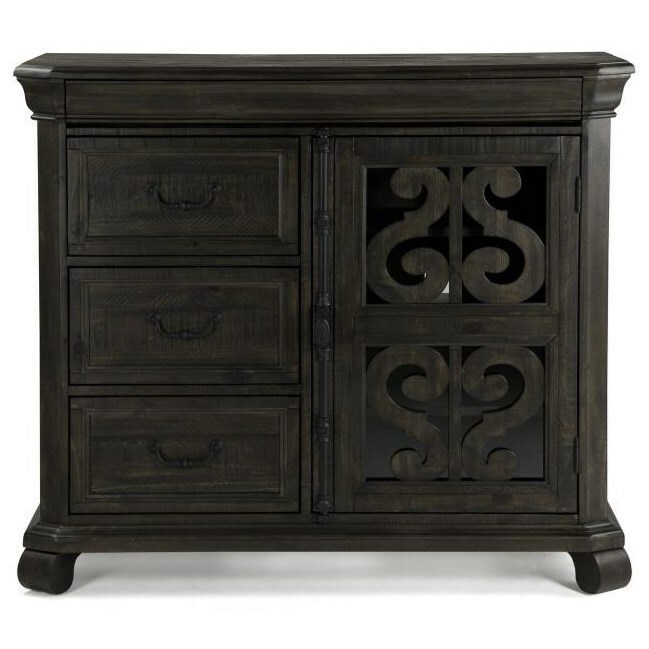 The collection has a Peppercorn finish adding a unique and updated element to the pieces. Bun feet, crown molding, and scrolled design work combined with hidden drawers and tucked away storage departments create a polished, yet functional collection, perfect for any style home. The Bellamy collection is a great option if you are looking for furniture in the Jackson, Pearl, Madison, Ridgeland, Flowood Mississippi area. Browse other items in the Bellamy collection from Miskelly Furniture in the Jackson, Pearl, Madison, Ridgeland, Flowood Mississippi area.